As I’ve mentioned before, I grew up in the Bronx during the 50’s. We had all the modern conveniences. Like Good Humor Ice Cream delivered daily in the summer down at the corner. Served up by the Good Humor Man himself. Otherwise known as some kid with a summer job, but at the time he looked pretty big to me. If you got an ice cream cup instead of something on a stick, it came with a little flat wooden spoon. If you chose the ‘ice’ on a stick there was work to be done to peel the paper off before you could take that first cold bite which froze your mouth and throat in a wave of pain when you swallowed. Which tasted really, really good in the midst of that summer heat and killer humidity. Up in our apartment we didn’t have air conditioning, but we did have Seltzer every night with dinner. It was delivered every week by, wait for it, The Seltzer Man. 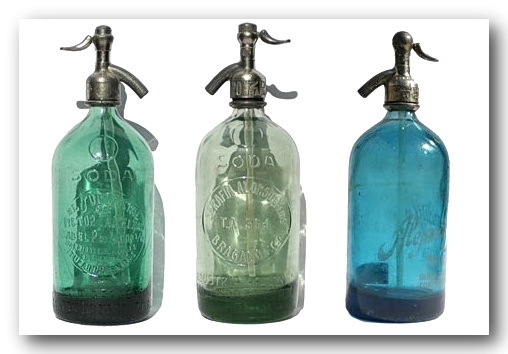 The Seltzer came in wooden cases filled with 10 or so big green, blue or clear bottles with embossed logos and lettering on the surface. On top was a silver colored valve, sporting a hair trigger. I think the bottles in this picture are a bit vintage, but it gives you an idea. The first time you opened the value on a new bottle the pressure would invariably shoot seltzer all over the kitchen. It was absolutely, positively impossible to open the value slow enough to avoid that first spritz. Kind of like when you first learned to drive with a stick and were letting out the clutch with your Dad telling you to go slow. This was all brought back to me recently by an article in the NY Times about Ronny Beberman, one of the last Seltzer Men. Remember kids, we are not talking about some pansy Perrier with a twist of lemon. We have a product we are real proud of, that starts with New York City water which “comes right outta the pipes, right outta the ground” and then beaten (literally) into Seltzer. Watch the video if you don’t believe me. This is Manly Seltzer, delivered by a Man’s Man. At my house, we are about to switch from the (dozens per week!) plastic bottles of seltzer to this: [Bob Edited out the link to SodaStream website, see reply below]. It still uses a plastic bottle, but I have more control over how many hours the plastic/water spends on a truck getting hot and cold and leaching those bag chemicals from plastic into the water — and then into my body. Plus, we throw out a lot of half-full bottles that go flat too quickly. It would be nice if they came up with a glass bottle version, but given the explosiveness you mention, maybe glass isn’t the best idea. Back in the day they used to sell special bottles that you would ‘charge up’ with small CO2 cylinders to make a carafe of Seltzer. They were metal so probably no safety issues, but I don’t know about the price…they looked expensive. Maybe you can still get these? I haven’t seen the little CO2 cartridges however. I removed the link to Soda Stream since the site froze my computer when I tried to get there using several browsers. It may have something to do with this Net book, since I’m sure the site worked for you…but there may be visitors with the same problem I had, so better to just suggest they do a search on Soda Stream and see what happens.